One of the things that bugs me the most about attributing supernatural causes to natural events is that it is, fundamentally, a lazy stance. Something odd happens, something for which there is no ready explanation. It amazes me how quickly people jump to "it's a miracle of god" or "an angel did it" if it was good, and "it was Satan" or "a demon did it" if it was bad. Conspiracy-based explanations are the same; how much simpler it is to say, "a secret evil government cadre is responsible" than it is to look carefully into the phenomenon and really find out what's going on. 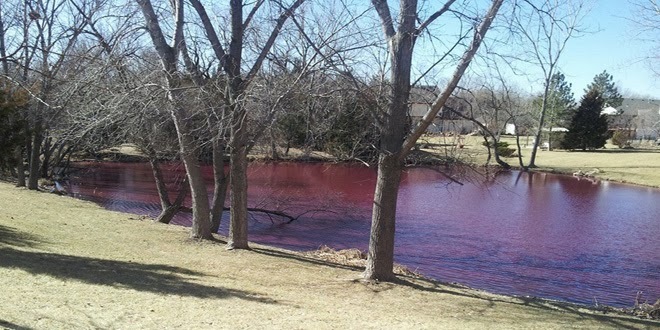 I bring this up because of a pond in Wichita, Kansas, which just a couple of days ago turned blood-red. The owner of the pond, Freddy Fernandez, is pretty sure there's a rational explanation, and when he posted the photos on Facebook, he was adamant that he didn't think it was anything but some peculiar but completely natural phenomenon. "I just don't want people showing up, thinking this is some Biblical phenomenon or something like that," Fernandez said. Well, a lot of people beg to differ. The water was poisoned by the government as part of a FEMA-based plan to kill everyone in the Midwest. The pond water was contaminated by chemicals rained out from "chemtrails." The blood-red color is a new life form, a highly pathogenic bacteria that was seeded there by bioterrorists. Because it's "water turned to blood," this is a sign of the ascendancy of the Evil One, and we should all be on the lookout for the Antichrist. It was the last one that seemed to be the most popular. Amongst the missives Fernandez received was one from a gentleman named Edward Cantu that read, "These things happen at the time of the End when Jesus Returns. Prepare for the coming of the Lord Jesus by repenting of all sin and recieving [sic] Jesus as Lord and Savior. Ask Him to fill you with His Holy Spirit. God Bless you." Of course, the more likely explanation is that we're looking at some sort of algal bloom, similar to what happens during a marine "red tide." But remember: I haven't been there, either. I also have run no tests, sampled no water. The difference is that I used the words "more likely." I don't know what the blood-red water is, and I'm perfectly content to wait until scientists run some tests (presuming any do) before I settle on an explanation I believe. That's the thing about being a skeptic; you don't have to have answers immediately. Or, perhaps, ever. If there's something you can't explain, you say, "I can't explain that." Then you look for a rational explanation, using the known facts, and whatever scientific techniques are at your disposal. You don't immediately jump to saying "it must be the government" or "it must be chemtrails" or "it must be the Antichrist." It all reminds me of a former student who couldn't stand not understanding things, not even for a moment. Her anxiety levels when confronted with having to suspend patiently a state of ignorance were off the charts. (As you might imagine, science was problematic for her, as in learning science you so often have to keep slogging your way forward, hoping the water will clear eventually.) One day, I was showing my class how to do a rather difficult numerical analysis technique, and I had a set of data we were going to be working with. So I put the data on the board, and said, "Copy the data, and after everyone's done I'll tell you what to do next." So my anxious student copies furiously, finishes first, and then starts to babble. "What do we do now? Do you want us to graph it? Will we need a calculator? Should I get out graph paper? What do you want me to do with the numbers?" And one of her classmates turned to her and said, "Kate, just let the damn data sit there and relax for a moment, okay?" To which I say: amen. Just let the damn pond be. Someone in Wichita who has a background in experimental science will undoubtedly figure out what is going on, and then we'll have an answer. Until then, it's perfectly okay for the skeptics to wait. Settling on an answer, based on essentially no hard evidence, is the lazy way out.